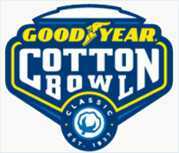 The Cotton Bowl is one of most anticipated college bowl games of the year. And, in 2018, the football classic joins the Orange Bowl as part of the 2019 college football championship playoffs. Watch as No. 2 Clemson square off against No. 3 Notre Dame when the Cotton Bowl airs on Friday, December 29, 2018 on ESPN at 4PM ET, live from AT&T Stadium in Arlington, Texas. Mother Nature was declared the winner of the 1947 College Bowl when snow and ice resulted in a score of 0-0 between Arkansas and LSU in a ill-fated matchup that was later nicknamed "The Ice Bowl." during the 1979 Cotton Bowl, a.k.a . On New Year’s Day 1979, Notre Dame and Houston met in the 43rd Cotton Bowl when future NFL Hall of Famer Joe Montana help the Fighting Irish defeat Houston 35-34. 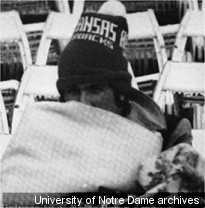 Recovering from the flu, Montana was sidelined in blankets and ate chicken soup for most of the matchup, later dubbed "The Chicken Soup Game". Cotton Bowl Classic - The official site offering news & updates, feature stories, player profiles and pictures, ticket purchase and travel guide. Cotton Bowl History - Check out a good background on the game from its early beginnings to the present day. Cotton Bowl Classic - Wikipedia coverage including a complete history, stats and winning teams with related resources.